How strange is the lot of us mortals! Each of us is here for a brief sojourn; for what purpose we know not, though some times sense it. But we know from daily life that we exist for other people first of all for whose smiles and well-being our happiness depends. The angular momentum of the system about the point A just before collision is the angular momentum of the block of clay which is equal to mvL. 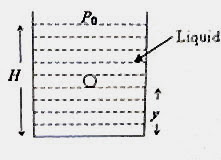 (Note that the perpendicular distance of the line of action of the linear momentum (mv) of the block of clay from the point A is L). The angular momentum of the system about the point A just after the collision is Iω where I is the total moment of inertia of the rod and clay and ω is the angular velocity of the system immediately after the collision. 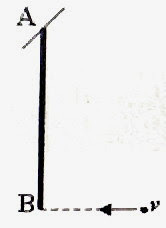 Therefore ω = 3mv/(3mL + ML). 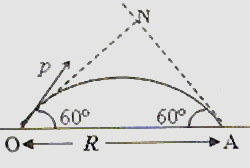 (2) A particle is projected at an angle of 60º with the horizontal with linear momentum of magnitude p. The horizontal range of this projectile is R. Just before the projectile strikes the ground at A, what is the magnitude of its angular momentum about an axis perpendicular the plane of motion and passing through the point of projection? Neglect air resistance. This is a very simple question. The magnitude of the linear momentum of the projectile just before it strikes the ground will be equal to p. The magnitude of the angular momentum at the moment will be p×Lever arm = p×ON = p×R sin 60º = (√3) pR /2. A small spherical monoatomic ideal gas bubble (γ = 5/3) is trapped inside a liquid of density ρℓ (see figure). Assume that the bubble does not exchange any heat with the liquid. The bubble contains n moles of gas. The temperature of the gas when the bubble is at the bottom is T0, the height of the liquid is H and the atmospheric pressure is P0 (Neglect surface tension). The force due to the pressure of the liquid is the buoyancy force. Therefore, besides the buoyancy force the forces acting on the bubble are the force due to gravity and the force due to viscosity of the liquid [Option (D)]. T P[(1- γ)/ γ] = constant where γ is the ratio of specific heats. [Many of you might be remembering this as T γ P(1- γ) = constant]. So option (B) is correct.